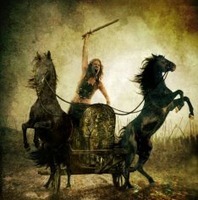 Are Roman Skulls Warrior Queen Boudicca's Victims? Blackened Roman skulls, possibly victims of Boudicca’s revolution which scorched the foundations of the Roman empire in Britain, have come tumbling out of a Crossrail tunnel in the heart of London. Archaeologists know they will find thousands of skeletons on the site, which was the 17th-century Bedlam burial ground, but the Romans are a surprise. The 20 skulls already found are not from a formal burial ground, but were discovered in clumps, possibly caught in bends on the banks of the long-vanished river Walbrook. Roman skulls have turned up in the past along the line of the Walbrook, and were often interpreted as victims of Boudicca’s rebellion, decapitated and slung ignominiously into the river, when in 61 AD her Iceni tribe swept south from their East Anglian home, and torched Roman settlements on their way to attack Londinium itself. However Jay Carver, the lead archaeologist on the project, who called the find “an unexpected and fascinating discovery that reveals another piece in the jigsaw of London’s history," fears the more prosaic explanation is that the Walbrook washed away the edges of a Roman cemetery further upstream, possibly soon after they were buried: skulls would have tumbled and rolled further in the water than long bones. The course of the new train line, deep under and right across the capital, is the biggest archaeology site in the UK, and has already produced more than 10,000 artefacts from mammoth bones to Black Death victims to Victorian crockery. The skulls were found by construction workers who are digging a deep pit beside Liverpool Street station to relocate utility cables. They have also exposed medieval timbers, which may be part of the walls of the medieval burial ground. The archaeologists are supervising their work, but the trench 20 feet down is too deep and unstable for any except specialist tunnellers. As the archaeologists get to work on the site next year, more Roman finds are expected as well as the mass of 17th-century bodies. The site has already produced a superbly engineered stretch of Roman road which once led down to a bridge across the Walbrook, and a Roman horseshoe stuck firmly in its surface, as well as the only gold on the whole Crossrail line, a little Venetian coin which was once stitched on to an aristocratic garment as a decoration. Source: Maev Kennedy, The Guardian, October 2, 2013.